I am not a big fan of cheesecake, nor was the rest of the family..may it baked, chilled or the cotton soft type. My only experience in baking a cheesecake was two years ago. My peach cheesecake tasted too sour to my liking..it end up in the..hahaha..you know where.. Since my younger biras has these cravings for cheesecake, I had to bake one for her before she's due. 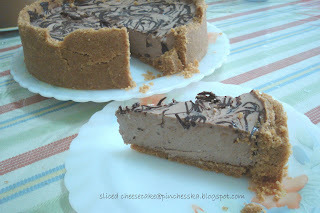 So..armed with a pendrive and and internet connection, I went hunting for the best , easy to do cheesecake. 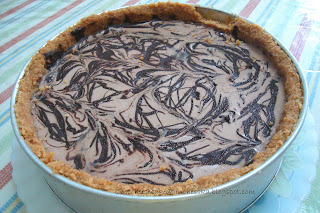 The mission was succesfull as I end up at CARI forum with a chilled choc cheesecake recipe. Easy to do and fast was the motto. I enjoyed making it. Even more enjoyable as the turnout was not bad at all. Using the leftover cookies as base was even better..skimping on costly food has become a routine..LOL. Membazir itu berdosa!! Sis, yg ni guna gelatin ke serbuk agar2? kalu guna serbuk agar2, brand apa eh? selalu kantoi tang tu laaa..